Welcome to: the "(AXCH) 2004 Mars Exploration Rovers - News, Status, Technical Info, History" page. Here you will find: news, updated status, scientific, technical info, photos, images, video, history, general updates, and more. This page is: an excellent starting point for browsing and finding information, facts, videos, and more. About: Mars and specifically Spirit and Opportunity, NASA and JPL's 2004 Mars Exploration Rover missions. [2004-03-02] MER Opportunity - Water, Water, Everwhere! Accumulation of a plethora of evidence reveals Mars's watery past! Mission successful. Read about it in this Press Release. Browse lots of water-related graphs and images to see for yourself. Quicktime (806 KB) | GIF (2.3 MB) | still JPEG (21 KB) | (info, details). JPEG (91 KB) | JPEG (647 KB) | Hazy Hills 3-D | (info, details). Separate closeup (MI) view of an embedded spherule: Hazy Hills page. JPEG (9 KB) | JPEG (29 KB) | JPEG (90 KB) | TIFF (263 KB) | (info, details). Trench closeup: Hazy Hills page. Arm over trench: Hazy Hills page. Rover arm sweeping over trench (F Hazcam): GIF (95 KB) | GIF (534 KB) | GIF (1.9 MB) | (info, details). Sparkling spheres in the trench (MI): JPEG (97 KB) | JPEG (318 KB) | JPEG (805 KB) | TIFF (1.1 MB) | (info, details). "Yesterday we dug a nice big hole on Mars," said Jeffrey Biesiadecki, a rover planner at NASA's JPL. (Press Release). Hole (first dug by either rover) dimmensions are: ~50cm long x ~20cm wide x ~10cm deep. Surrounding crater + trail to trench (Navcam/Hazcam mosaic): JPEG (64 KB) | JPEG (315 KB) | JPEG (2.3 MB) | TIFF (11 MB) | (info, details). Hazcam animation of the dig: GIF (372 KB) | GIF (638 KB) | GIF (2.0 MB) | GIF (2.2 MB) | (info, details). The hole (Hazcam): JPEG (34 KB) | JPEG (317 KB) | (info, details) || Cropped: JPEG (26 KB) | JPEG (134 KB) | (info, details). Hole Anaglyph (Hazcam): JPEG (134 KB). GIF (333 KB) | GIF (1.4 MB) | GIF (1.6 MB) | (info, details). Highlighting the oddly regular pebbles and spherules that speckle the rock dubbed Stone Mountain (and surrounding dirt). Stone Mountain context (Pancam): JPEG (18 KB) | JPEG (63 KB) | JPEG (1.9 MB) | TIFF (41 MB) | (info, details). Stone Mountain closeup (Pancam): JPEG (62 KB) | JPEG (783 KB) | TIFF (3.2 MB) | (info, details). Stone Mountain closeup (Pancam), stretched false color: JPEG (121 KB) | JPEG (1.8 MB) | TIFF (3.2 MB) | (info, details). Stone Mountain closeup (Pancam) anaglyph: JPEG (456 KB). Pebbly Dirt closeup (MI): JPEG (65 KB) | JPEG (325 KB) | GIF (178 KB) | More in Sol 14 MI Raw Images. More berries in 3-D (2004-02-12): JPEG (106 KB) | JPEG (1.2 MB) | (info, details) | Free-view 3D. More images and info available with 2004-02-09 and 2004-02-12 Press Releases. "The greatest interplanetary brushing of all time" (Gorevan) followed by a 3 hour RAT rock grinding (first ever). Ground patch is 45.5 mm in diameter and 2.65 mm deep. Spirit's hand in front of the "Adirondack" rock (Pancam): JPEG (59 KB) | JPEG (137 KB) | JPEG (1.2 MB) | TIFF (3.2 MB) | (info, details). Post grinding 1 (Front Hazcam): JPEG (47 KB) | JPEG (116 KB) | JPEG (139 KB). Post grinding 2 (Pancam, gray): JPEG (62 KB) | JPEG (384 KB) | TIFF (1.1 MB) | (info, details). Post grinding 3 (Pancam, color): JPEG (194 KB). Grinding results composite closeup: JPEG (63 KB) | JPEG (232 KB) | JPEG (355 KB). Highlights of Opportunity's first drive (~6m) over three Sols. Front Hazcam (linearized) Thumbnails: JPEG (36 KB) | JPEG (202 KB). Front Hazcam (linearized) Animated: GIF (289 KB) | GIF (881 KB) | GIF (3.5 MB) | GIF (3.5 MB) | (info, details). Front Hazcam Thumbnails: JPEG (43 KB) | JPEG (234 KB). Front Hazcam Animated: GIF (303 KB) | GIF (1 MB) | GIF (3.9 MB) | GIF (4.1 MB) | (info, details). Front Hazcam rock outcropping Free-view 3D: Free-view 3D. Rear Hazcam Thumbnails: JPEG (32 KB) | JPEG (183 KB). Rear Hazcam Animated: GIF (229 KB) | GIF (782 KB) | GIF (2.8 MB) | GIF (2.8 MB) | (info, details). Looking back Free-view 3D: Free-view 3D. 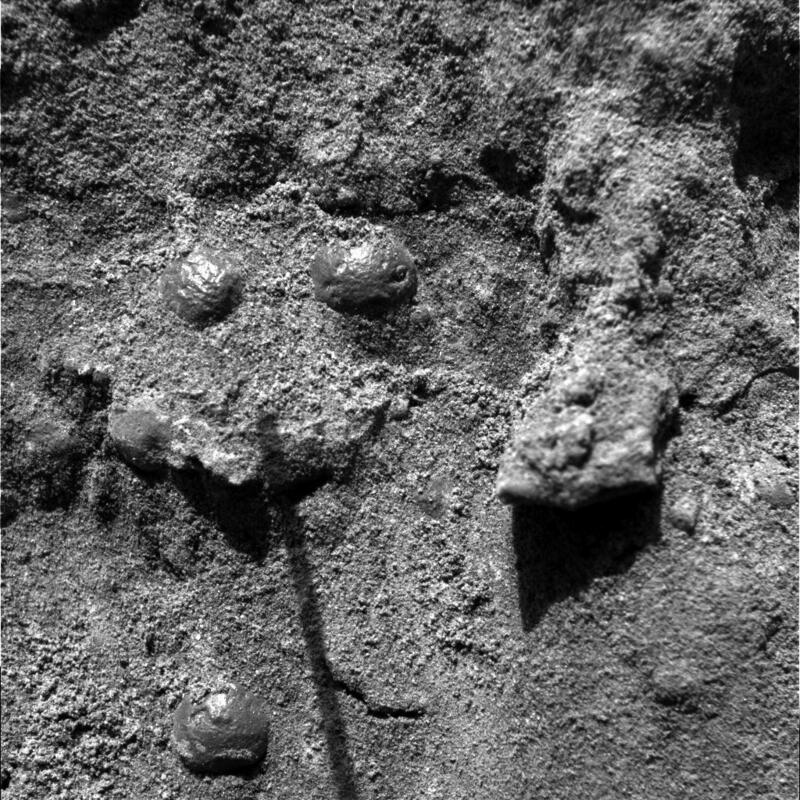 Microscopic Imager shows composition of dirt and pebbles at the Meridiani landing site. Scale: Examined patch of soil is 3 cm across. Circular grain in the lower left is ~3 mm across, or about the size of a sunflower seed. Dirt, Normal: JPEG (125 KB) | JPEG (933 KB) | TIFF (1.1 MB) | (info, details). Dirt, RGB-Stretched: JPEG (137 KB) | JPEG (2 MB) | TIFF (3.2 MB) | (info, details). 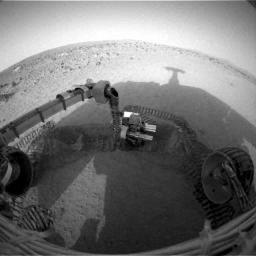 Arm hovering over the dirt (from front hazcam): JPEG (35 KB) | JPEG (66 KB) | TIFF (263 KB) | (info, details). Dirt, Animated: GIF (168 KB) | flipped GIF (638 KB) | flipped GIF (2.6 MB) | GIF (2.6 MB) | (info, details). Image: JPEG (14 KB) | JPEG (291 KB) | JPEG (8.5 MB) | TIFF (48 MB) | (info, details). Fullscreen QuickTime VR: QuickTime VR (zoom in on the rocks!). Front hazcam view of outstretched arm. Normal: JPEG (25 KB) | JPEG (54 KB) | TIFF (263 KB) | (info, details). Anaglyph: JPEG (42 KB) | JPEG (578 KB) | TIFF (2.9 MB) | (info, details). Views (from Pancam, on Mars) of four main instruments on the end of the Rover's arm. Press Release containing images and descriptions. Rear hazcam view of the lander shortly after successfully rolling off. Normal: JPEG (25 KB) | JPEG (277 KB) | TIFF (1.1 MB) | (info, details). Anaglyph: JPEG (48 KB) | JPEG (679 KB) | TIFF (3.2 MB) | (info, details). JPEG (78 KB) | JPEG (1.4 MB) | JPEG (14.7 MB) | TIFF (69 MB) | (info, details). Color: JPEG (29 KB) | JPEG (378 KB) | JPEG (4.1 MB) | TIFF (22.1 MB) | (info, details). Anaglyph: JPEG (28 KB) | JPEG (652 KB) | JPEG (6.7 MB) | (info, details). [2004-01-25] MER Opportunity - Meridiani Planum, Just Landed! MER-B Opportunity landed successfully at Meridiani Planum and sent back these image of its new surroundings! Pancam color mosaic: JPEG (55 KB) | JPEG (212 KB) | JPEG (4 MB) | TIFF (20 MB) | (info, details). Navcam 360° panoramic: JPEG (25 KB) | JPEG (72 KB) | JPEG (412 KB) | (TIFF 1.1MB) | (info, details). Mars Odyssey orbiter image showing MER landing sites: JPEG (62 KB) | JPEG (378 KB). Navcam Stereoscopic 3D images: Hazy Hills Page. New information and data regarding Spirit's landing on Mars. More information here. Animated GIF showing landing site before/after: GIF (435 KB) | GIF (734 KB). Annotated landing site, (from orbiting Mars Global Surveyor [2004-01-19]): JPEG (25 KB) | JPEG (237 KB) | GIF (4 MB). Flyby tour 1: Thumbnail JPEG (16 KB) | AVI (18.5 MB). Flyby tour 2: Thumbnail JPEG (11 KB) | MPEG (5.5 MB). Spirit's now empty landing site, the Columbia Memorial Station, at Gusev Crater, Mars. This spectacular view may encapsulate Spirit's entire journey, from lander to its possible final destination toward the east hills. Pancam mosaic taken from ~2m away. Empty Nest: JPEG (46 KB) | JPEG (159 KB) | JPEG (1.3 MB) | JPEG (3 MB) | (info, details). Probing the first target rock, Adirondack. From front hazcam. 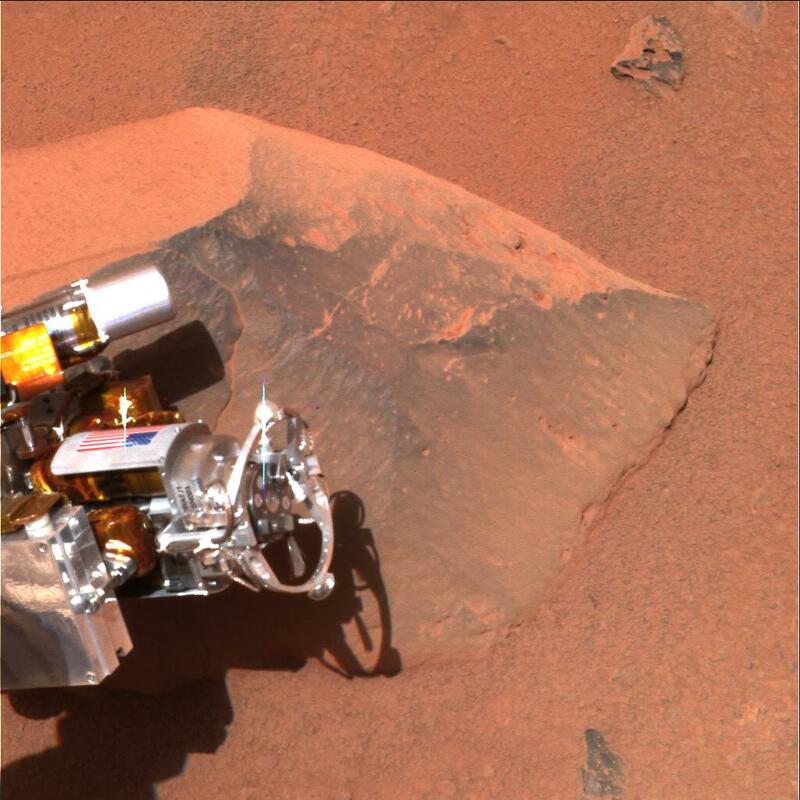 At the time this picture was snapped, the rover had begun analyzing the rock with the alpha particle X-ray spectrometer located on its robotic arm. Probing: JPEG (49 KB) | JPEG (99 KB) | TIFF (263 KB) | (info, details). Adirondack (on approach, from pancam): JPEG (50 KB) | JPEG (401 KB). [2004-01-16] MER Spirit - Martian Dirt ... in 3D!!! Odd to get excited over a picture of dirt, but this is the "sharpest look yet at the surface of another planet" (src: NASA), and it's in 3D. Taken by Spirit's Microscopic Imager on newly deployed arm. Dirt Anaglyph: JPEG (116 KB) | JPEG (209 KB) | TIFF (2.5 MB) | (info, details). Dirt Stereo Pairs: Hazy Hills Page. Penny: JPEG (40 KB) | JPEG (93 KB) | TIFF (240 KB) | (info, details). From front hazcam, a view of Spirit's newly unfolded arm (aka Instrument Deployment Device (IDD)). Normal: JPEG (51 KB) | JPEG (115 KB) | TIFF (1.1 MB) | (info, details). From rear hazcam, approx 1m away from lander, first image sent back of Spirit's nest for the last 12 Sols. First time rover touched Martian soil. Normal: JPEG (45 KB) | JPEG (107 KB) | (info, details). Anaglyph: JPEG (51 KB) | JPEG (94 KB). Stereo Pairs: Hazy Hills Page. PanCam Anaglyph: JPEG (66 KB: small) | JPEG (1 MB: ~3Kpx3Kp) | TIFF (29 MB - wow) (info, details). JPEG (59 KB) | JPEG (8.05 MB!) | (info, details). QuickTime VR: QuickTime VR | (info page). Full set: Hazy Hills First Light (well arranged). Mosaic Image: JPEG (57 KB) | TIFF (1 MB) | (info, details). Mosaic Image (red/blue 3-D): JPEG (36 KB) | JPEG (74 KB). Flash version (from Florida Today): Flash (works in Flash 5). 360° Flash Panoramic! : Flash | (info) (requires Flash 6). MER-A "Spirit": MPEG: large (9.2 MB) | small (3.1 MB) || QuickTime: large (4.6 MB) | small (1.3 MB). MER-B "Opportunity" MPEG: large (9.5 MB) | small (3.9 MB) || QuickTime: large (3.8 MB) | small (0.8 MB). Images: NASA Mars Rovers Public Image Gallery (various categories). Images: NASA Mars Rovers Press Release Images - Spirit (by date). Images: NASA Mars Rovers Press Release Images - Opportunity (by date). Images: NASA Mars Rovers Raw Spirit Images (by Sol and camera - good link). Images: NASA Mars Rovers Raw Opportunity Images (by Sol and camera - good link). Images: NASA Mars Rovers JPL Image Archives (by date). Images: MER Imagery Technical Index (full index of raw MER images from JPL, by date/time, plus auto-gen color composites/anaglyphs!). Images: Center for Mars EXploration CMEX Image Navigator (by category, great images). Images: NASA Planetary PhotoJournal: Mars (full searchable DB, up to date). Images: SystemsFirst Mars JPL Server Mirror (mirror (HTTP/FTP) of JPL images, video. Includes custom-made color 3-D images!). Images: MarsQuest Online Image Library: Spirit | Opportunity (Flash6 required). Images: Terragen/MOLA generated Red Planet Rendered Image Gallery. Images+: MERIL - Mars Exploration Rover Image Library (organized mirror of images, video, more). ImagesVR: Hans Nyberg's QuickTimeVR Mars Archive (great fullscreen QTVRs of Mars). Images3D: Mars Unearthed Home | MER Anaglyph Index | Good Spirit Anaglyphs (nice site, good images). Images3D: Hazy Hills Mars 3D: (Spirit first light) (Opportunity first light) (Great collection of updated free-view 3D Mars images). Images3D: David Neufer's Be On Mars extreme photo constructions (well made and nicely arranged anaglyphs). Images3D: Thom Bone's Mars Site (lots of nice custom-made red/cyan 3D stereo pictures). Videos: Mars Rovers Challenges of Getting to Mars. Videos: Mars Rovers General Videos. Videos: Center for Mars EXploration CMEX Online Movies (great QT movies, some James Earl Jones narration). Videos: Discovery Channel dailyplanet (updated news, images, animations, analysis). Image: NASA Project Team Photo. Image: NASA MER Rover Diagram (with detailed callouts). Video: Maas Digital's MER Animated Illustration (QT dl) (dramatic, scientifically accurate, fully CG). Video: Color Rotating Mars (made from 1995 HST images). Video: PBS NOVA MARS Dead Or Alive (excellent hour-long online video program). Video (Live) - NASA TV || RealMedia/WinMedia, src NASA: NASA Feed. Info: Conspiracy? No. NASA Is Not Altering Mars Colors (alt) (explanation of PanCam, wrt strange appearance of calibration sundial in some pics). Info: MER2004 Image EDR filename encoding/decoding: NASA EDR Filename Key | Filename visual overview, src: Cave of Mars. NASA Mars Rovers Press Releases. NASA/JPL Mars Rovers Daily Update Archive. NASA Mars Rovers Press Release Images - Spirit | Images - Opportunity . NASA/JPL Mars Rovers Image Archive (updated daily). Live Video - NASA TV || RealMedia/WinMedia, src NASA: NASA Feed. NASA FY2005 Budget Request | (Mars Exploration portion (PDF 237 KB)) . Spaceflight Now Front Page | MER live Status Page (excellent, updating detailed status). Mueller Planetarium MER Mission Highlights (single page chronology with lots of images, good text). MarsToday.com | Mars.tv images and video (updated news, good images). Florida Today Return To Mars (good editing, well presented). Houston Chronicle Going To Mars (timely, good writing, pics, hypertext). Universe Today Front Page | Mars Section (space news from around the Internet, updated every weekday). MarsNews.com - Newswire for the New Frontier (lots of updated news from many sources, searchable, good summaries). NASA Watch (current and future goings on at NASA, unaffiliated). Google News search (terms: mars rover; sort: newest first). Yahoo! News "Mars Exploration" section. Discovery Channel dailyplanet Videos (updated news, images, animations, analysis). Planetary Society MER News Archive (great timely summaries, writing, and pics). Space.com - Mars Rovers (lots of content, jumbled navigation). Astrobiology Magazine Front Page | Mars Topic. Martian Soil (updated news blog, well edited). Adot's Notblog (includes NASA Press brief transcripts, unofficial, very interesting). 2020 Hindsight (good coverage, quick reporting of NASA press briefs). Images: Michael Lyle MER Imagery Technical Index (full index of raw MER images from JPL, by date/time, plus auto-gen color composites/anaglyphs!). Images: Hazy Hills Hazy Hills Mars 3D (Great collection of updated free-view 3D Mars images). Steven Squyres Athena News (by Athena Science Payload Principal Investigator). James Roberts Mars Rover Mission Blog (good writing and links). Mini-TES Latest technical updates (from ASU team). Oliver Morton Mainly Martian Blog (lots of details and musings). Q Daily News (periodic color composites of MER images) (e.g.). Robby Stephenson periapsis.org (works at and has photos of JPL). MikeD's Marswalker Journal (works at Wind River Systems, makers of VxWorks RTOS). new mars Unmanned Probes Forum (good, intelligent discussions on many topics). Universe Today Robotic Space Exploration Forum . NASA Rover Technology Overview: Rover Overview Index | Rover Diagram. Rover General Overview: | Info (src: exploratorium) | Parts (src: Planetary Society) | Technical Data (compilation). Cornell Athena main page (responsible for instruments) (great site, very technical, updated). Rover Instruments (General) info: | Info (src: NASA) | Info (src: Athena) | Info (src: Planetary Society) . Rover Instruments (Specific): | Mini-TES (home) | Pancam | RAT | Mössbauer Spectrometer . Rover Pancam: Info (src: Athena) | Tech Briefing (PDF 52 KB) | Info (src: Planetary Society) | Info (src: NASA) | Info (src: Caves of Mars). Rover Pancam Innards Photo (showing color filter wheel): (JPEG 54 KB | 160 KB | 795 KB) . Rover Pancam Filter Specs (showing approximate color swatches in browser). Rover APXS (Alpha-Particle-X-Ray Spectrometer): Info (src: Athena) | Info (src: Planetary Society) | Info (src: NASA) . Rover Arm Instruments as seen on Mars (RAT, Microscope, APXS, Spectrometer) - Press Release. Rover CPU (radiation-hardened RAD6000 32-bit RISC chip): by BAE Systems | (Press Release). Rover Operating System: VxWorks | by Wind River Systems | (Press Release). Rover Brains Overview article (on CPU, OS, memory, temperature, etc.). Rover Arm (aka Instrument Deployment Device (IDD)): by Alliance Spacesystems, Inc. (ASI) | (Press Release). Rover RAT (Rock Abrasion Tool): by Honeybee Robotics | (Press Release (DOC)) || scientific paper (PDF 243 KB). Mars Rover Owner's Manual (unofficial) from Astrobiology Magazine (good overview, mission, and technical details). Planetary Society MER and Soujourner Rover Comparison. Spacecraft Technology: Launch Vehicle | Spacecraft | Cruise Config | Entry/Descent/Landing. Entry/Descent/Landing (EDL): Timeline | Step by Step | Diagram | Slideshow. Baltimore Sun article on airbags vs. thruster-and-leg approach. NASA Mars MER2004 Landing Sites | (Flash6 version). NASA Spirit Mars landing site: Gusev Crater. NASA Opportunity Mars landing site: Meridiana Planum | More on Target Ellipse. Wikipedia entries: MER-A (Spirit) landing in Gusev Crater || MER-B (Opportunity) landing in Meridiani Planum. Spaceflight Now Gusev Crater article. NASA - Previous Mars landing sites: Pathfinder, Viking 1, Viking 2. NASA data-heavy NAS landing site info (from NASA Supercomputer guys). polygonworlds Mars3D MER Virtual Landing Site Reconstructions (pretty pictures). Mars weather: Malin (MSSS) MGS weekly weather forecast (including forecasts at MER landing sites). Mars MER2004 Mission Home Page. NASA M2K4 Mars 2004 Flash Site (slick Flash6 interface). MER2004 Mars Exploration Rover Landing Press Kit (PDF 1MB, 46pgs) from NASA . Mars MER2004 Mission Project Team (Team Photo Page). Mars MER2004 Mission Athena Science Team (includes links to personal pages). NASA Ames Computational Sciences Division: Destination: Mars (more) (good mission overview, covers a lot of the custom ground control software). Wikipedia entries: Mars Exploration Rover Mission | MER-A (Spirit) | MER-B (Opportunity). Mars MER2004 Communication with Earth | DSN (Deep Space Network) | Wikipedia: DSN || Illustration: JPEG (38 KB) | JPEG (207 KB). Maestro - Explore Mars with the program that NASA scientists use to operate Spirit and Opportunity. Download Maestro now! NASA Article: Revealing Mars' True Colors (all about cameras, imaging, panoramas, the team, the issues, transmission, etc.). MER2004 Image EDR filename encoding/decoding: NASA EDR Filename Key | Filename visual overview, src: Cave of Mars. NASA NSSDC Mars Fact Sheet (bulk params, earth comparison, atm, rot, orbit, satellites). Views of the Solar System Mars Scientific Data (excellent and detailed, with data tables, images, history). Planetary Society Mars Facts (comparison to Earth and Luna). NASA Welcome to the Planets: Mars (good info, pretty image-based feature navigation). NASA GISS Time On Mars (Java program and browser applet which displays a Mars "sunclock"). Marsbase Time On Mars table (sunrise, sunset, solar time, mars local time, sol date, etc.). Marsbase Mars Clock Schematics (how to build your own Mars clock). Marsbase Mars Sky Finder chart (find Mars in tonight's sky - cool!). Marsbase Mars Map - labelled atlas of the regions of Mars (good, easy to read). NASA Mars Today (daily generated poster with Mars conditions and relationship to Earth). NASA Center for Mars EXploration (CMEX) (atlas, calendar, gallery, science, etc.). NASA CMEX Mars and Earth Comparison (scientific data table). NASA CMEX Mars Orbital Characteristics (compared with Earth too). NASA CMEX Seasons on Mars. John Walker's "Orrery": Solar System Live (view current position of the planets - awesome tool). USGS Astrogeology Research Program Martian System Nomenclature | USGS More Mars Info. Bill Arnett's Nine Planets: Mars | more pics. Cochise Mars Geological Overview (many links to stories and pics). University of Glasgow's Mars Facts (bullet point textual facts). Mars weather: most info comes from Mars Orbital Camera (MOC) and Thermal Emission Spectrometer (TES) aboard Mars Global Surveyor (MGS). Mars weather: Daily Martian Weather Report (from MGS science team, interesting but out of date). Mars weather: MGS Thermal Emission Spectrometer Project Homepage | Daily TES temperature data. General - Stereoscopic Photography Overview by John Wattie (includes X and U free-viewing (cross and parallel), without equipment). General - Stereoscopic X-Rays of a Sea Shell by John Wattie (great starting point to practice free-viewing). General - JPL Spotlight: How to make 3-D pictures (goot description of how to shoot and generate anaglyphs). General - read/blue anaglyph 3-D glasses, sources (unaffiliated): NASA recommended vendors || Photo 3-D (high quality, online order) || Mars Unearthed (free, send e-mail req) || Reel 3-D (bulk, online order) || Rainbow Symphony (free, send SASE req) || spaceKids (KIDS ONLY, free, send e-mail req) || Berezin Stereo Photography (largest selection) || 3-D images Ltd (in UK, free by email or phone). General - China3D (Chinese) specializes in color anaglyphs, including this color Spirit anaglyph and this color anaglyph. Mars Exploration Rover Mission Project Team (Photo). Athena Science Team members (includes links to personal pages). Global Mars Missions Historical Log summary table. NASA History Office's Chronology of Mars Exploration (with summaries and links). NSSDC Chronology of Mars Exploration (visual timeline, with details on each mission). Planetary Society Mars Mission History. NASA Missions (see sidebar): Past | Present | Future. NASA Current and past Mars mission Fact Sheets (good, concise PDFs). NASA looking back at Mars Pathfinder / Sojourner. | (Pathfinder Home Page). ExploreMarsNow: Interactive Mars Habitat (interactive Flash site about future Mars colonization). Mars Scorecard (play-by-play of Earth vs. Mars missions, very funny). Beagle2 - British led exploration of Mars, lost contact during landing phase (2003-12). WordSources Word origin and relationship to Planet Mars (Roman "Mars", Greek "Ares"). Loggia Mythography of Ares (Greek God of War). Mars in Film and Radio (including list of Mars movies). Mars through history (Babylonians, Tycho Brahe, Galileo, and more). MSNBC Life on Mars? Flash presentation (SWF 180 KB) (history of human belief and knowledge of life on Mars). Mars Timeline by A. J. S. Rayl (incredible - complete history of the human viewpoint on Mars through science, fiction, movies, music, and missions). The movie "Total Recall": in IMDB | on Rotten Tomatoes | on amazon.com | Audio clips. Image: "Yankee go home!" 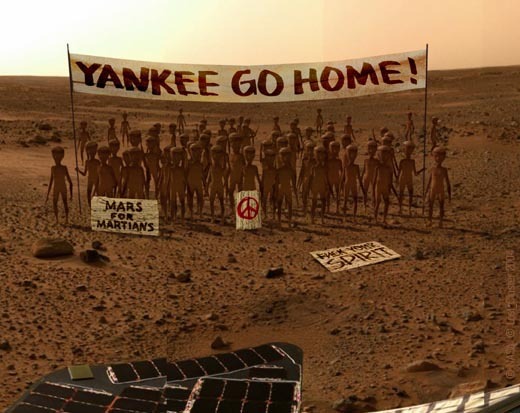 (JPEG 62 KB) Martian protest. 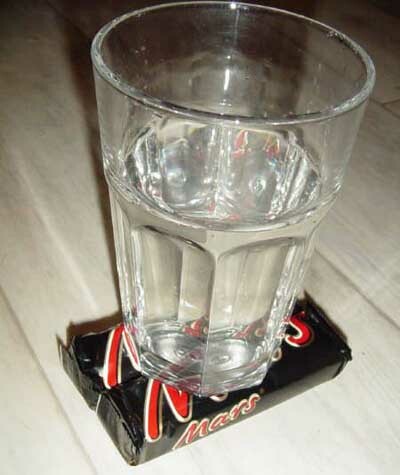 Image: Water on Mars! (JPEG 36 KB) (from LifeSucks.dk). Cartoon: "Hold still... It's taking another picture.". Cartoon: First signs of life on Mars. Cartoon: "Stop playing Polar Lander...". Cartoon (Animated): Rovers in Iowa (by Mark Fiore). Cartoon: Martian Welcome (GIF) (by Mike Luckovich). Cartoon: @#*!$*c! Ashcroft!!! (GIF) (by Mike Luckovich). Cartoon: Last Image Received from Mars Rover. Cartoon Archive: Slate Mars Cartoonists Index (lots of cartoons by professional cartoonists). Cartoon Archive: CartoonStock Mars Archive. Comic Strip: Prom On Mars. Animation: Rover applies the RAT. Poster: Motivation: Mars (JPEG 69 KB) (spoof of motivation posters) (src: orig page). News: 3 Yemenis sue NASA for trespassing on Mars. Long John Silver's: If NASA finds conclusive evidence of an ocean on mars, America eats Free Giant Shrimp (JPEG). Chart of songs from daily wake-up music played by NASA ground control: src: periapsis [2004-01-14] | src: ATSNN [2004-02-21]. Astrobot Diaries (by LEGO® minifigure Astrobots Biff Starling and Sandy Moondust). Last photo sent back by Mars Rover. Digital Space Commons Drive On Mars (actually drive rover through virtual Martian environment). Mars rover Pepsi Commercial (Pepsi main ad page). The Mars Game (Mars colony online role-playing game, set in present, heavy political slant, outgrowth of MarsGov). Outpost 8 (Mars colony online role-playing game, set in the year 2040). This page is an excellent starting point for browsing and finding information, facts, videos, and more about Mars and specifically Spirit and Opportunity, NASA and JPL's 2004 Mars Exploration Rover missions. Bookmark this page and use it to drill down into the information you are looking for, or just browse around and see what's out there. This page is updated frequently as new information, images, and data are sent back to Earth and posted on the web. The mini-Mars symbol ( ) indicates an especially interesting, useful, or recommended link. The rover image that appears in the header of this page as well as the thumbnail images are courtesy of NASA/JPL-Caltech. All other images, video, and data linked to is courtesy of the respective sites containing them. Translation to other languages via the flag icons at the bottom of this page is provided courtesy of FreeTranslation. All dates on this page are in ISO 8601 format (YYYY-MM-DD). (AXCH) 2004 Mars Exploration Rovers - News, Status, Technical Info, History. For news, status, updates, scientific info, images, video, and more, check out: <br /> <a href="http://axonchisel.net/etc/space/mars-exp-rover-highlights.html" >(AXCH) 2004 Mars Exploration Rovers - News, Status, Technical Info, History</a>. (AXCH) 2004 Mars Exploration Rover Highlights. 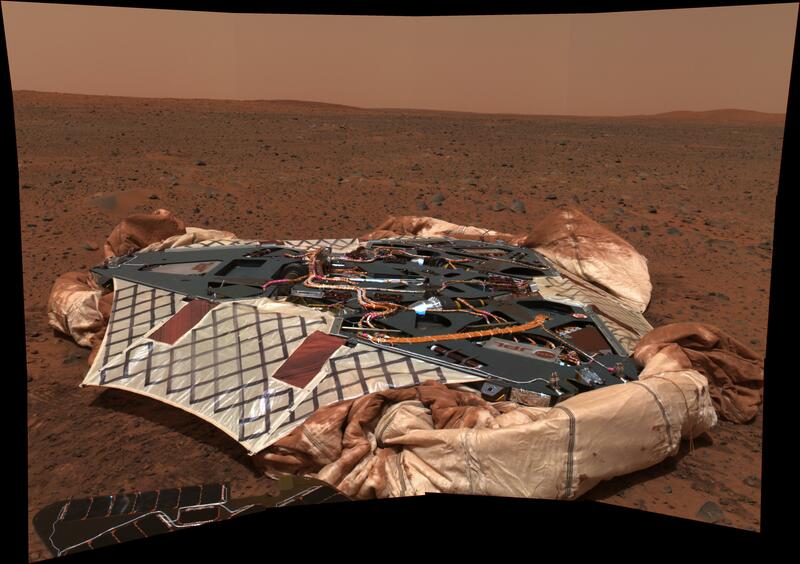 <a href="http://axonchisel.net/etc/space/mars-exp-rover-highlights.html" >(AXCH) 2004 Mars Exploration Rover Highlights</a>. We are always interested in hearing from our audience. We welcome suggestions for new content, notifications of broken links, spelling corrections, notes of appreciation, or whatever else you feel like saying. To submit feedback, send e-mail to dmars@axonchisel.net.